Lincoln Elementary in El Reno, Oklahoma celebrated Dr. Seuss' Birthday with quite a celebration. The morning started off with the students being served "Green Eggs and Ham" for breakfast. The morning assembly began with the honorable, Judge Ed Cunningham administering the reader's oath to all the students. Judge Cunningham told the students the importance of reading. If they wanted to go on a journey all they had to do was open a book. Fourth grade teacher, Nancy Salsman along with the help of her grandson, Tanner wheeled in a birthday cake to kick off the celebration. Students sang "Happy Birthday" before heading to class. Activities planned throughout the day included high school students reading their favorite "Dr. Seuss" story to the elementary students in English and in Spanish, reading and graphing their favorite books, locating books published from all 50 states, as well as having State Representative Wayne Pettigrew visit the school. 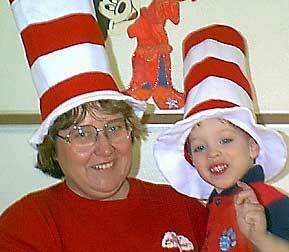 The Dr. Seuss celebration was tied into the school's year-long reading program as well. By the fire or the pool. The readers oath was taken from the NEA's Read Across America website. Teachers.Net offers a Read Across America chatboard at http://www.teachers.net/mentors/raa/ and a mailring http://teachers.net/mailrings dedicated to discussion about ways to make Read Across America Day 2001 the most effective to date. The NEA offers a compilation of links to reading research, news and activities on their Read Across and Reading Matters sites at http://www.nea.org/readacross/ and http://www.nea.org/readingmatters. Bookmark the Read Across America Chatboard.